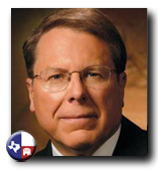 Wayne LaPierre is the Executive Vice President of the National Rifle Association. He has worked as a government activist and lobbyist since receiving a M.A. from Boston College. He began working for the National Rifle Association in 1978 as a state liaison in the NRA Institute for Legislative Action (NRA-ILA). LaPierre would become Executive Director of the NRA-ILA in 1986 before taking over the top position at the NRA in 1991. As Executive Vice President, LaPierre is in charge of the NRA’s 76 member Board of Directors and directs the organization’s policy. LaPierre is a staunch supporter for gun rights. "When law enforcement isn't available, Americans turn to the one right that protects all the others, the right to keep and bear arms." Click here to learn more about the 2013 NRA Annual Meetings and Exhibit in Houston, Texas May 3-5th.